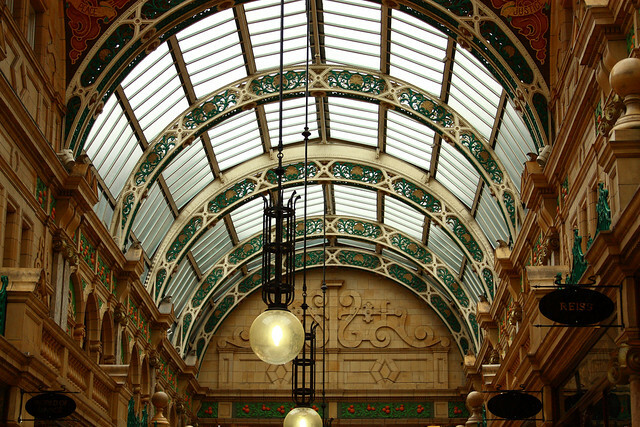 At the heart of the Leeds shopping experience is the historic Victoria Quarter, a collection of ornate Victorian covered arcades that are more than 100 years old. Since the early part of the 19th century, the area was known for its slaughter houses, butchers, fruit and vegetable stores and the Bazaar. In 1900, the area was transformed with the help of the eminent theatre architect Frank Matcham. He designed the elaborate Victorian arcade which encompassed two streets, two arcades and the Empire Theatre (now the site of Harvey Nichols). When ownership changed hands in the late 1980’s, a large scale restoration programme was undertaken to create the Victoria Quarter. The centre has changed ownership twice since then and is currently owned by the Bank of Ireland. It is home to 76 retailers and has been fully occupied throughout the current recession. It attracts 150,000 visitors a week and has come to be known as ‘the jewel in Leeds shopping crown’. The spaces created by the buildings provide for a high level shopping experience. The Grade II* listed buildings, with the largest stained glass window in Britain (746.9sq.m.) and with the classic Victorian County Arcade, all combine to provide a theatrical experience heightened by the individual shop windows, all of which add to the rich visual feast. The centre is used by a wide cross-section of the community as there are opportunities to pass through in several directions whilst being sheltered from the weather, to stay to just sit and watch, to have a coffee or a snack or a gourmet meal, or to meet and greet or simply to shop. The spaces work very well but only between first thing in the morning to the early evening when the shops are open. It is the lack of alternative ‘uses’ that result in what are effectively ‘part-time’ spaces. There was an opportunity to introduce some activity, by way of conversion of the unoccupied upper levels into apartments but the business case was won by the proposal for more retail space. There are occasional events but these are relatively limited to the daytime only and in the evenings the activity is often solely in relation to the Harvey Nichols ’roof-top’ restaurant as, ‘invitation-only’ occasions. The uses of the spaces can therefore be claimed to be inclusive during the shopping hours but only exclusive to nil at all other times. To assess the space in terms of its prime and only use can only result in an ‘excellent’ rating. To assess the space in the wider context of sustainable inner city living can only result in an ‘average’ rating. The centre appears to be largely immune from the recent severe recessionary effects – the visitor experience remains the same as at the height of the boom years – however there are some signs of a drop in revenue (no information was provided regarding this) with a resultant increase in the comings and goings of various retailers. The centre has undoubtedly become an enduring part of Leeds’ city centre ‘offer’ able to deliver a memorable experience for over 10 million visitors a year and still receiving accolades and awards associated with various ‘superlatives’ in the retail world. Being ‘top of the range’ in shopping terms does however bring with it an exclusivity that really only allows selected retailers to be part of the centre and those with sufficient disposable income to take part fully in the real ‘traditional’ shopping experience. The ‘Leeds shopping experience’, is now something more than simply going to the shops to buy. So depending on where you stand on the definition of ‘shopping’ then the centre can be characterised as either entirely ‘exclusive’ or ‘inclusive’, a ‘landscape of consumption’ or an ‘excellent free leisure facility’?